Time for something completely different. Or so I thought when I picked Teal Haviland’s “The Reaping Chronicles: Inception” out of my ‘to read’ list. It’s been a very long time since I read anything with angels in it (the last time I tried the plot holes were so ginormous I couldn’t finish reading that novel) and I’d been following “Inception” on Facebook for some time. This is the first in book in “The Reaping Chronicles” series that seems to be the usual epic battle between heaven and hell though in this case centered around one particular book and one (odd) love triangle. “Inception” gives us the foundation for the series and introduces the lead character Gabriel, her former lover, Javen and a young human who manages to capture Gabriel’s heart in dreams. I thought the novel was mostly fun, though as is usually the case with a novel so intrenched in a single religions mythology I found it a bit heavy handed and overly righteous at times. Gabriel did a lot of pondering about the problem of keeping humans from straying from the path of righteousness and never really seemed to reach any useful conclusions, or understanding. Still what’s not to enjoy in a tale full of creatures of myth and legend and heroic (and sometimes stupid) deeds? “Inception” was definitely epic in length, being nearly twice the size of your average ebook. Definitely readable, especially if you love the Christian mythos. Might be a bit too much if you’re not much for religiously themed fiction though. 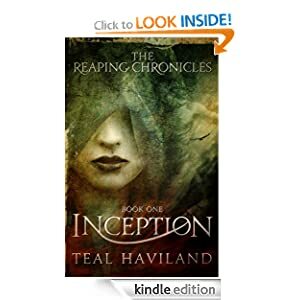 This entry was posted in Ebook Reviews and tagged 99 cent ebooks, Book Reviews, cheap ebooks, ebook, ebook review, Inception, indie author, Teal Haviland, The Reaping Chronicles by YKG. Bookmark the permalink.